Peggy McQuitty has 18 years of experience as an accountant; she completed her schooling over nine years, while working full time. 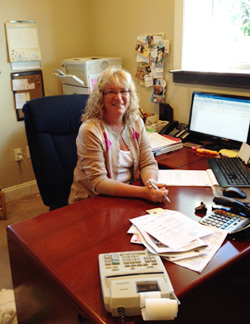 She and her team cater to small businesses who either do not have the time or the experience to complete their accounting, payroll or tax matters, from single tax returns to full service Office/Administrative services, Peggy is dedicated to making you breath easier at tax time. Originally Peggy chose the path of an accountant following a bout with premed (she hated it) and a major change to business. Although she dreaded taking the accounting classes, and even put off taking them until the very last semester, she ended up loving the classes and what she learnt. Peggy worked as a controller for three different large corporations in Baltimore, MD, for about 15 years. She then started her own firm due to her dedication to her family. Her son Dylan, born in 1995, had Cerebral Palsy and was completely dependent on her and her husband until the time he passed away in 2009. Starting her own firm gave her the ability to work from home, and still look after her son. She is still amazed at how well her bookkeeping endeavour has turned out.